Brought to you by IGT. Another simple and fun slot to play. The Free Spins bonus feature lets you choose how many spins you get and even throws in another wild symbol for you. The addition of the tumbling reels feature seals the deal. 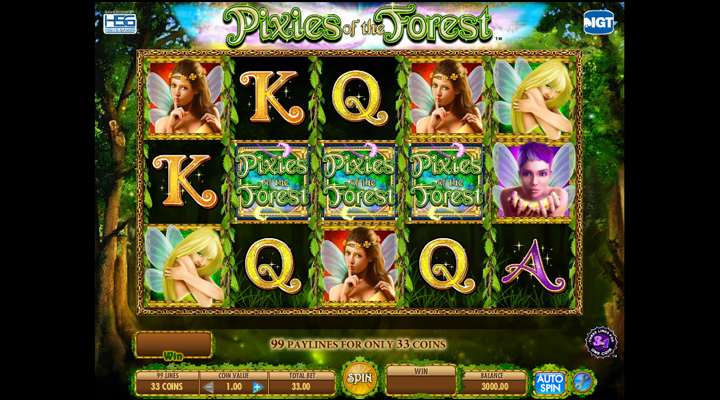 No stranger to producing top quality slots, Pixies of the Forest are the brainchild of IGT and this is one great looking slot. This is a 5 reel, 99 payline slot and we’re obviously dealing with fantasy pixies and the like… unless you’re not of this world in which case, could we have the winning numbers and best stock options to invest in? Thanks in advance. Forests of enchantment and Celtic imagery aside, we’ve got some Pixies that have different hair colors and well as the Pixies of the Forest slot logo. The bonus symbol is this leaf thingie, and then we’ve got a purple symbol that is our wild. We got two different bonus features that we can trigger. The first is tumbling reels. Winning paylines disappear and are replaced with new combinations, making for a real possibility of more and more wins. The best feature is probably when you hit three or more of the bonus symbols - this triggers the free spins feature. Click on the “Choose” button of your choice and then you’ll see how many spins you’ll end up getting. During these free spins, you’ll get an extra wild symbol on the first reel. Simple, like all the best slots are. The free spins bonus round is nice, but with the addition of the tumbling reels feature, this is a slot worth trying.